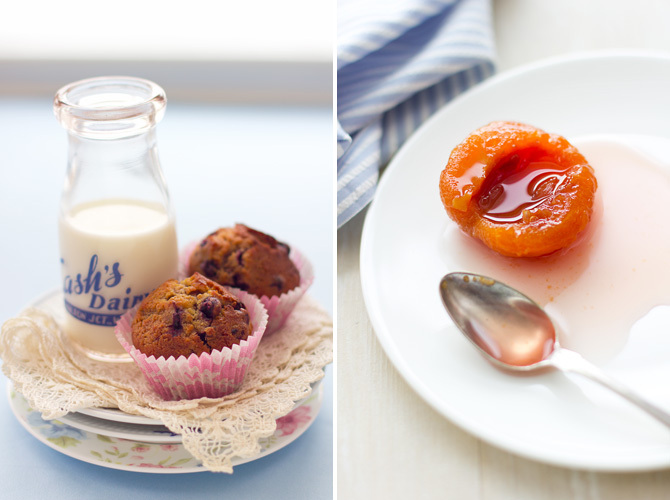 Bilberry muffins and a rosé poached apricot. Oh dear, Minnie has been licking the floor again. She seems to be getting a kick out of licking the ash blocks in the parquet. Twice now, I have been woken by a peculiar sanding sound, only to realise it's Minnie rasping away on the floor, on that same block. First, open the tin of mangoes. Strain the syrup into a mug and cut the mango cheeks into cubes. Soak gelatine sheets in cold water for about 5 minutes. Warm the passion fruit pulp to 45°C and dissolve the gelatine in it. Now mix together 100g of the diced mango, mandarin juice, passion fruit pulp with gelatine and about 100ml of the strained syrup. Pour into four 200ml capacity glasses, cover each with cling film and let set in the fridge. I made this coconut mousse simply by using an iSi gourmet whip*. It was as easy as could be. Soak gelatine in cold water for about 5 minutes. Warm the single cream to 45°C and dissolve the gelatine sheets in it. Mix this with the coconut cream and sweeten to taste with icing sugar. About 3 spoonfuls should do it. Pour this mixture into a half litre capacity iSi cream whipper, charge with N2O, shake vigorously and leave to set in the fridge for at least 5 hours. Just before serving, peel the kiwis and cut into dice. 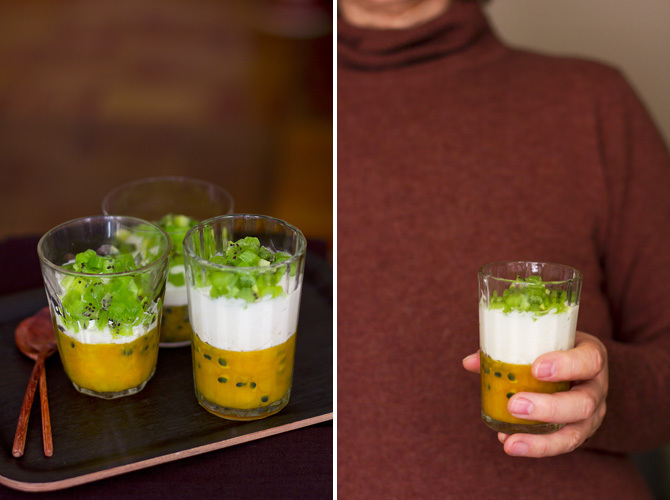 Top the passion fruit jellies with the coconut mousse, then scatter with kiwifruit and serve straight away. *In case you don't have a siphon bottle, I imagine this mousse could be whipped up by whisking it in a smaller bowl set over a large bowl of ice, or in one of those small ice cream machines that require freezing the bowl beforehand. Mis nende isuäratavate saiakeste vahel on? Maitse järgi tundub, et natuke martsipani, suhkrusiirupit, sutike muna, mandliekstrakti ja ehk veel mingi koostisosa, mis elastsust hoiab. Poevärk, pakendit ei lugenud! Pistaatsiamartsipan on ka seda värvi, kahtlustasin algselt seda. It looks divine. I've forgotten about kiwis! What are the pastries? You make no mention of them. I didn't mention these cause I didn't *actually* make them, was store bought pastry roll, I just sliced it and popped in the oven. The greenish thing is a sort of pistachio marzipan or something. 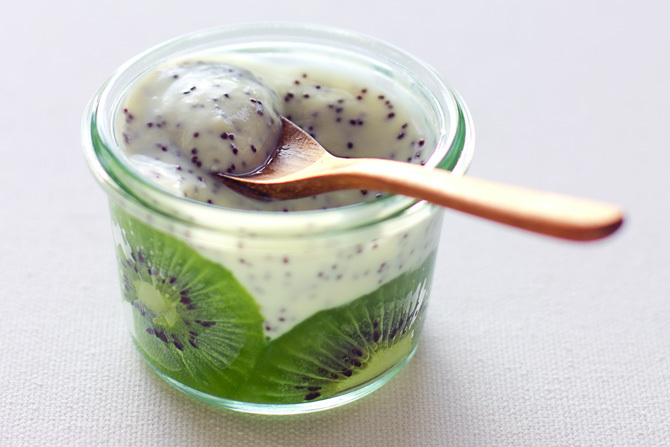 Funny thing with the kiwis, at first I wanted to add kiwis to the jelly, but after two attempts at it, I figured it wasn't going to happen as it didn't set at all. It was just a slimy goo. Uh. Anyway, I looked it up on the net and yes, certain fresh fruit will ruin the jellifying process. Like kiwi, pineapple, papaya etc. Oh, everything looks wonderful and so tasty! Schön, schön, schön, schön, schön, schön, schön! 'reingestolpert, Link gemopst... auf bald, bald, bald, bald, bald, bald, bald...! 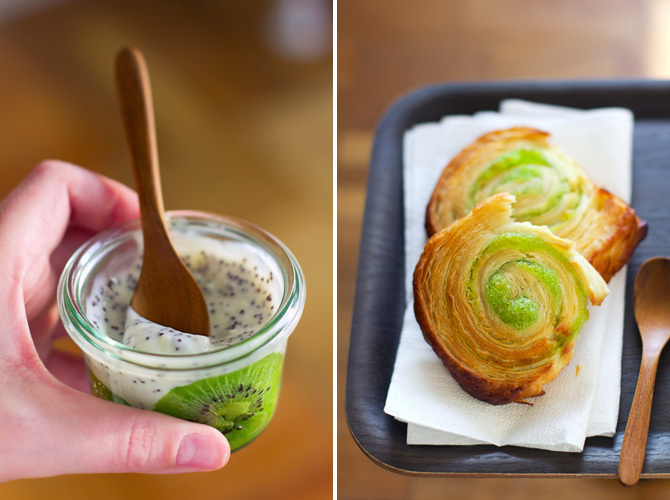 What is the recipe for the picture showing a pot with kiwi slices and a creme in it ? 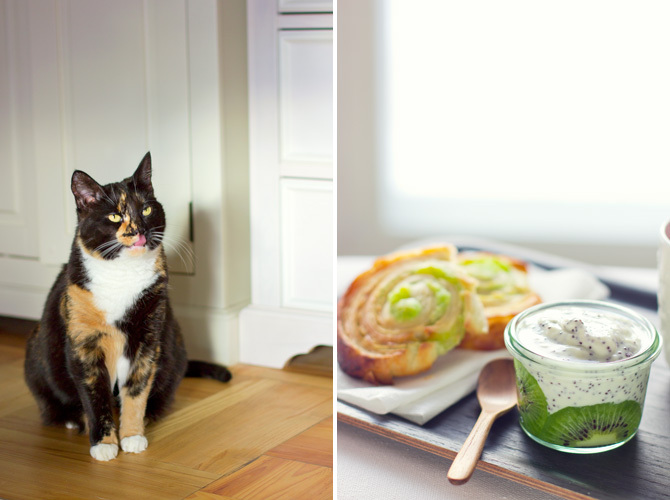 Lulu, it's just kiwi slices at the bottom with thick poppy seed yoghurt on top.